Well everyone (the very few people) who reads this know that I have a passion for cooking. I would love to cook as a career, but that would make it an obligation as opposed to a hobby. I could be wrong. Anyway, I love to take recipes that I hear from other people or read about and turn them into something unique. I am going to try (emphasis on the word "try" as I am nearly incapable of being on time for these things) to post a recipe on Fridays. Some are simple and some might prove to be a bit of a challenge but bear with me. If I can do it, you can do it! My friend Ann and I both share this passion for food.Often times/almost every time I go to her house she has a cookbook on the counter. This always gives me something to look at too! I can guarantee you that we bring up a recipe or some type of cooking adventure at least once each time we see each other which I think is why we get along so well! Mix everything together and enjoy!! 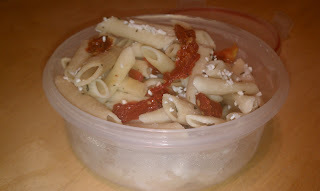 **Tip: Run the pasta under cold water to rinse until pasta is very cold. That way you don't have to wait for it to cool off in the fridge! In a large bowl combine 1 cup brown sugar, 3/4 cup flour, 1 cup quick oats (oatmeal), and 3/4 cup softened butter. Mix until it is crumbly. Break apart and crumble on top of the apples. Bake at 350* for 35-40 minutes or until golden brown. 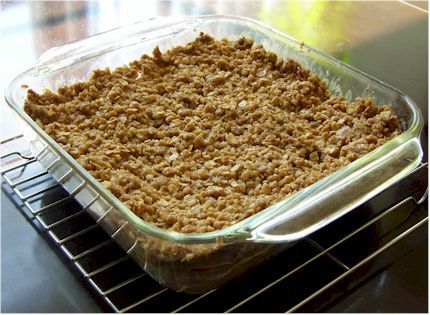 **Tip: Tyler LOVES the crisp part (but not as much as me...) so we normally double the recipe (but not the apples) and put some on the bottom of the baking dish before we put the apples in. Yum!! This is a Google picture, but mine looks the same. Or it did... before we ate it!